Figuratively Speaking returns next Friday ... today, though, there is a graver concern, as the military junta in Burma (Myanmar) refuses to allow aid or aid volunteers into the country. At least 22,000 are imagined dead and tens of thousands no doubt are walking around without food, water or shelter. My heart breaks for them. Hurricane Floyd in 1999 here in Greenville resulted in a flood that covered a third or more of our city. I remember we had no power and couldn't drink the water. You couldn't drive anywhere. We were lucky that our home wasn't flooded, though during the storm, water actually seeped in through the walls so powerful was the driving rain. One day Greg and I managed to get to Wilson. I'll never forget that experience. Remember in the Wizard of Oz when Dorothy lands and the world is in color? That's how it was to leave Greenville and arrive in Wilson, where life was normal. When we returned to Greenville, it became dark, bleak and hopeless again. Everywhere you looked were ruined houses, downed trees and chaos. Helicopters buzzed overhead. You couldn't work, you couldn't leave your house. 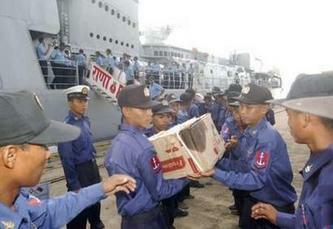 So I hear about this disaster and I feel for the Burmese. And who can forget what was taking place in Burma just weeks ago ... when the brave Buddhist monks were beaten and killed as they protested the military government? Today they are categorized with criminals and the mentally ill and not allowed to vote. We have a situation in Burma that is immoral. The world is watching and as we do, we become guilty.